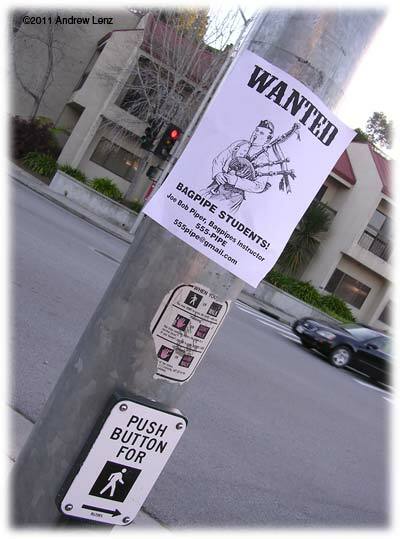 ... or How to Find Future Bagpipers to Teach! So, you've become sufficiently skilled as a bagpiper that you feel that you can turn around and successfully teach what you've learned to the next generation of pipers. Maybe your own instructor retired or or moved away and there is a desperate need for local instructor, and so you have made an outline of instructional steps and are ready to go. Maybe you are an experienced instructor who has moved to a new city. One small problem. It's hard to be an instructor with no students! Here are some things to try in your quest to seek them out. Rule #1. ALWAYS take business cards with you. You never know when you will run into an interested individual. Rule #2. Read Rule #1. • Get yourself a website with your own custom domain name. Websites are relatively inexpensive and are a great value for the investment. Potential students will be able to find you online 24 hours a day, 7 days a week. While they are free, Facebook and Myspace will do you little to no good; it can't hurt, but don't have great expectations. Craigslist can't hurt, and sometimes pipers get gigs using that to promote their services; but personally, I wouldn't look there for an instructor, I'd search on Google first, followed by phone calls to local shops. If you can't afford a professional web designer, either do your own (perhaps using templates found online) or see if you can find a teenager to do one for you at a discounted rate. If you can't afford a fancy website, start with a site that is basic, listing your contact information and qualifications. Make it easy for students to find your contact information. It wouldn't hurt to have this information on every page on your website—typically at the top or bottom. If there are hours that are you not available to instruct—say 9-5 Monday-Friday—by listing these times on your website you may save yourself and a potential student some time if they are only available when you are not. You might also offer what your expectations are of your students—time to spend practicing, length of lesson, items they must buy, etc. Students may also want to know if you do house calls or if they must travel to your designated practice location. Testimonials would be nice too if you have any. • Go talk to the local music stores and, if they exist, any celtic stores. Let them know that you are around in case anyone asks for bagpipe instruction. Leave business cards and, if they will let you, fliers. Many of these stores also keep a list of local instructors. Some stores offer instruction (sometimes after hours) and make ongoing agreements with instructors to teach on their premises. • Visit your local library. If they have a bulletin board, put up a flier. Consider a flier with a series of tear-off strips at the bottom with your name, contact information, and "Bagpipe Instruction." Perhaps the library will let you do an educational presentation, showing the general public (and potential students) how the bagpipes work. • Also contact elementary schools and let them know that you are available for a teaching about the pipes. Be prepared to at least superficially discuss clans, tartans, kilts, etc. • Contact the music departments of local high schools and junior high schools. These can be a perpetual source of students. Some schools will even pay you to give private lessons to students as part of an independent study program. Ask if the administration will let you give a performance on campus, perhaps during recess or lunch time if class time isn't available. Such a performance can inspire listeners to, for the first time, consider learning the bagpipes and will also let those who have been considering such an undertaking know that you are there. You can also try colleges, but these can be less fruitful. • If your city has an adult community education program, see if they will let you offer a class. You might opt to waive any fee or charge a nominal fee for your class. A fee-based class will weed out those who aren't at least somewhat serious. Once your class is complete, those who are genuinely interested and stick with it can move on to private lessons with you. • Contact any local Scottish or Irish societies and offer business cards, fliers, and presentations. If they have a newsletter, see if they will mention you; if they won't, see if you can take out an ad without breaking the bank. • Drop fliers off at the local fire and police departments, a traditional hotbed of budding pipers. • If there are pipers or pipe bands in your area and they are not instructing, let them know that you'll be happy to take any students that they have to turn away. • If there are any high profile events in your area, such as parades, fairs, benefits, renaissance fairs, festivals, etc., get yourself involved and in front of as many people as possible. This may involve sacrificing any performance fees in exchange for the exposure. People will magically recall that they've been wanting to learn the pipes and approach you. • If you are the busking type, again, playing in public is exposure to potential students. • Donate a certificate good for a free bagpiping performance (specify a maximum performance time, maybe 30 minutes) to a school's or non-profit's silent auction. • Since pipers are a fairly unique bunch, sometimes you can get the media (particularly newspapers) to write a feature/interest story about you. Newspapers usually have someone on staff who specifically works on these types of stories, find out who this is. The writer will have the most interest if the story ties in with an upcoming event (see previous bullet point). • See if you can find an outdoor place to practice your bagpipes that is noticeable but not annoying to anyone . . . more of a thoroughfare than a place where people will stay and be forced to listen if they don't want to. Remember, we're looking for exposure. • Check with your regional pipe band association. Some associations maintain a list of instructors and some even post that list online. • Get yourself listed with any online instructor lists. Betterfly has one. There's also a listing at Ceolas, but don't be fooled. It's relatively ancient and has not been not updated for years; the form is erroneous and the e-mail address it uses bounces. • Paid advertising in periodicals meant for the general public is another, though costly, method of reaching possible students. Newspaper display ads, classified ads, yellow pages in the phone book, etc. Such advertising can be effective, but the candidate you are looking for is typically 1 in 5,000-10,000 people. It's a needle in a haystack. And that's assuming they even see your ad. With periodicals, you have two ends of a spectrum: 1) blow your budget in one large visible ad, and hope that readers read every issue; 2) go for smaller repeated ads that may be missed due to size but won't be missed because readers only pick up an issue now and then. Paid advertising can run from the hundreds of dollars to the thousands of dollars. It's all based on how much stale bread you can stand and how valuable you consider your students to be! You can also take out ads online, such as using Google Adwords, but again, there are likely much more effective methods to employ. One last caveat. Don't teach unless you are sure can pass along good piping skills. Yes, there is income. Yes, there is prestige. Yes, you get to meet people. But if you aren't forming a good piper, you are doing a disservice to your student. Sometimes no local instructor is better than a bad instructor—there are always exceptional online instructors available via Skype and other methods on the Web. On the other hand, if you have had recognized good pipers tell you that you are also a good piper, you shouldn't have too many reservations in taking on teaching. If you have the patience, the organization, the desire, the personality, and the time, do it! This page last updated Friday, February 17, 2012. Page first created in March 30, 2011. This page was initially being written in August 2010 and neared completion. At the end of that month, I received a devastating call. My 13-year-old nephew, Peter, had been killed at the Indianapolis Motor Speedway. He was struck by another rider while warming up for a national motorcycle race in which he was seeking to maintain his standing as #1 in his class. Peter had benefited greatly from mentoring and those who believed in him. This mentoring is the handing of knowledge and skill from one generation the next and is as important in motorcycle racing as it is in bagpiping. Here's to Peter's memory and to instructors of all kinds around the world.